The Montreal Forum was built at the foot of a mountain dominated by St. Joseph’s Oratory on one side and an illuminated cross on another. It was a fitting place for fans to make pilgrimages to a hockey shrine. The Forum was home to some of hockey’s greats: Howie Morenz, Rocket Richard, Jean Beliveau, Jacques Plante, Guy Lafleur, Ken Dryden, Larry Robinson, and Serge Savard. It welcomed the hockey world for 72 years. 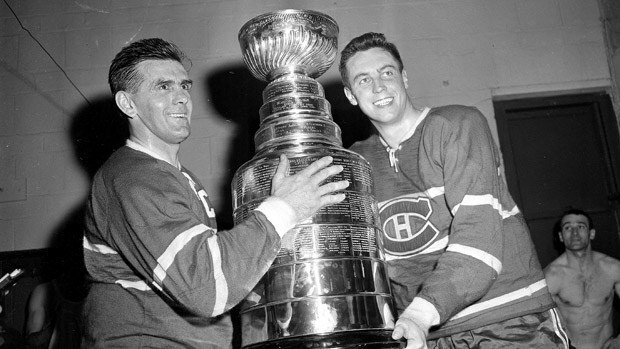 Richard and Beliveau with the Cup. 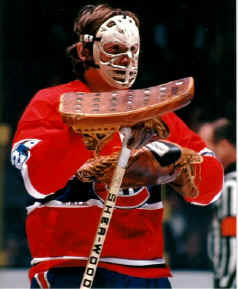 Fans were almost always in for a treat, be it a save by Plante, an end-to-end rush by Lafleur or a Richard goal. For those willing to make a mad dash, there was a coveted spot along the standing room only rail. Home to 24 Stanley Cup championships (22 for the Canadiens and two for the Montreal Maroons) it saw more than its fair share of success. Only two visiting teams ever won the Stanley Cup on the Forum ice– the New York Rangers defeated the Maroons in 1928, while the Calgary Flames defeated the Canadiens in 1989. The venue was both charismatic and mystical, home to the most successful sports franchise in the world. Both the home and visiting teams were motivated to kick their game up a notch. Just knowing you were skating on the same ice as so many champions was a thrill in itself. 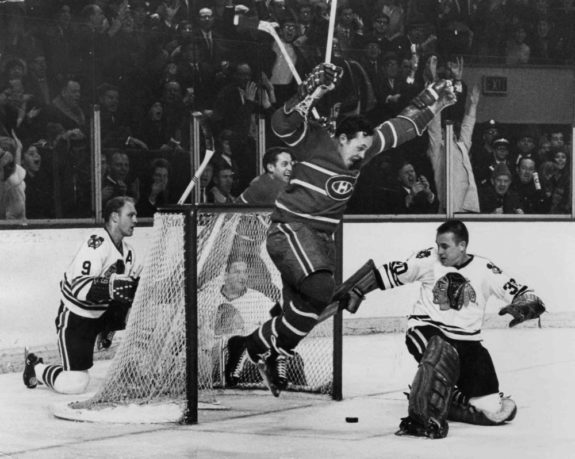 Yvan Cournoyer scores against the Black Hawks. It was a vibrant, nostalgic arena that stimulated all the hockey senses. 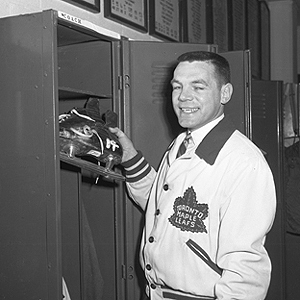 The lobby was full of bronze castings and the Habs’ locker room was filled with photographs of the team’s Hall-of-Famer players–Morenz, Richard, Beliveau, and Doug Harvey to name a few. 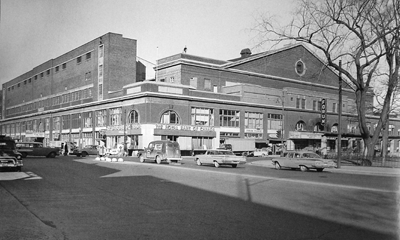 The name “Forum” came from the original roller skating rink that occupied the site at the northeast corner of Atwater and Saint Catherine West. The Forum was actually first used as a roller rink that encircled an outdoor rink. This was built in 1908 by Joseph-Alphonse Christin and stood until 1923 when what most regard as the old forum was built. Before that it had been an outdoor ice hockey rink used by legends Frank and Lester Patrick, Art Ross and Russell Bowie. All of these men later played in the NHL were eventually inducted into the Hockey Hall of Fame, either as a player or a builder. The 9,300-seat arena Forum was built in 1924 by the Canadian Arena Company in just 159 days at a cost of $1.5 million Cdn ($21.4 million in 2016 dollars). It was the brainchild of Sir Edward Beattie (President of Canadian Pacific Railway). The original plan was to build a 12,500-seat rink, but due to finances, they were scaled back to only 9,300 seats. With trouble finding money for financing, H.L. Timmins stepped in and backed the project. The Montreal Forum first opened its doors on Nov. 29, 1924. It was the home of the NHL’s Montreal Maroons from 1924-38 and the Montreal Canadiens from 1926-96. In the building’s first game, Montreal defeated the Toronto St. Pats by a score of 7-1. The longest game in NHL history was played at the Forum on March 24, 1936. The game between the Detroit Red Wings and the Maroons was decided in a sixth overtime period when Mud Bruneteau scored the game’s only goal, giving Detroit a 1-0 victory. The most sombre chapter in the Forum’s history came when one of the building’s great superstars tragically passed away. On Jan. 28, 1937, in a fluke circumstance, Canadiens superstar Howie Morenz caught a skate in a rut along the boards and suffered a gruesome leg fracture. Morenz–known as ‘The Stratford Streak’ for his speed–died a few weeks later at a local hospital. His casket lay in state at center ice for tens of thousands of mourners to pay their respects and thousands more lined the route of his funeral procession. 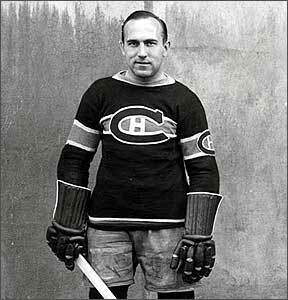 Howie Morenz was the greatest hockey star of the early era, and was beloved by the Montreal faithful. The legend goes that when the doctors told Morenz the injury would make playing hockey again impossible, he died of a broken heart. 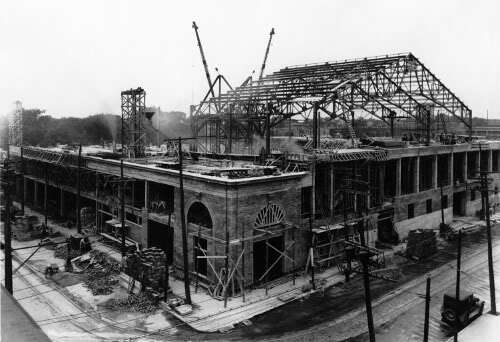 During the Depression, the Canadiens suffered on the ice and the Forum was nearly sold to become a streetcar barn. Frank Selke became the team’s general manager in 1946. He built one of the league’s greatest dynasties–the Habs were in the Stanley Cup Final ten straight years and won six championships. In 1949, 3,163 seats were added during a lengthy renovation that cost $600,000. Capacity was 12,500 seats. One of the most infamous nights in Forum history took place on March 17, 1955–the night of the Richard Riot. The story began a few days prior to that, when the Habs played the Bruins in Boston. The Rocket slugged a linesman during a skirmish with Bruin Hal Laycoe. Clarence Campell, the NHL President suspended him for the rest of the season and the playoffs. The Habs hosted the Detroit Red Wings in the next game in Montreal and Campbell sat in his usual seat at the Forum. A boisterous crowd vocalized their disdain for Campbell and his decision, shouting, “We want Richard. Down with Campbell!” They pelted him with debris and one fan actually hit him. A tear-gas canister exploded and the rowdy crowd spilled into St. Catherine Street, where they smashed storefront windows. An extensive renovation took place in 1968 at a cost of $10 million. The project took place during the off-season and brought capacity up to 17,959 seats with improved air conditioning. In the mid-1980s, a new score clock was installed above center ice with a color matrix board on each side. At around the same time, a high-pitched siren was installed to signal the end of a period. The last game at The Garden was on March 11, 1996 between the Canadiens and the Dallas Stars. The Habs won, 4-1. Guy Carbonneau, captain of the Canadiens from 1989-94, took the ceremonial opening faceoff. After the game, many Habs alumni took part in post-game festivities, including Maurice Richard. He broke down in tears while receiving a 16-minute standing ovation. Emile Bouchard then carried a symbolic torch, one representative of the quote in the players’ dressing room, out onto the ice. The torch was passed between former captains (Beliveau to Yvan Cournoyer to Henri Richard to Serge Savard to Bob Gainey to Carbonneau) to then-current captain, Pierre Turgeon. The following day, the torch was carried in a parade to the new Molson Centre. It was inspiring in every way. The team settled into their new home, the Molson Centre, a few days later and won their opener against the New York Rangers. In 1996, the Forum was gutted and many of its parts were auctioned off. 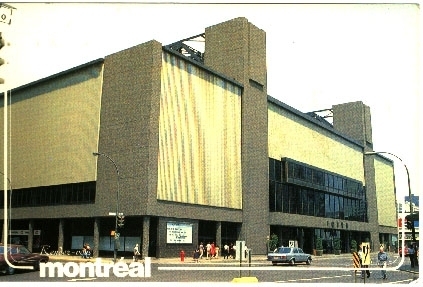 After bidding farewell to the Forum, the Canadiens moved into the Molson Centre (then called the Bell Centre). The storied Forum de Montreal has since been converted to a Cineplex movie theatre and entertainment complex. The center ice circle is still there for hockey fans to stand on and reminisce, even a small section of the old red seats remains, like ghosts of the glory days. Former Leaf coach Howie Meeker. The Forum has hosted much more then hockey games. Over the years, the legendary venue was home to many sports and concerts. 1937 – The Forum hosted its first and only funeral, for Canadiens great Howie Morenz. Morenz died from complications due to a broken leg, sustained in a game against the Chicago Blackhawks on January 28. 1947 – The Montreal Royals won the Allan Cup on home ice. 1964 – The Beatles performed and recorded live versions of several songs. 1970 – Roger Doucet sings the National Anthems at the Forum for the first time. 1972 – The Forum hosted game one of the famous “Summit Series” between Team Canada and the USSR. Team USSR won the game 7-3. 1976 – The Summer Olympics (gymnastics, handball, basketball, volleyball, and boxing). The first ever perfect 10 in a gymnastics event in Olympic history was performed by Nadia Comaneci. 1980 – Hosted the 1980 NHL Entry Draft was hosted at the Forum, the first time that an NHL Arena hosted the event. 1980 – Journey recorded the first four tracks off their live album Captured. 1981 – The Canadian rock band, Rush, filmed (and recorded nearly all of their 1981 concert film and album, Exit…Stage Left. 1981 – British rock band Queen recorded and filmed their concert film, titled We Will Rock You (re-released as Queen Rock Montreal in 2007). 1983 – American musical duo Hall & Oates filmed and recorded their concert film, Rock ’n Soul Live. 1983 – The live portions of Black Sabbath’s video for the song “Zero the Hero” were filmed.